The Case of the Stolen Sixpence by Holly Webb. Book 1 in The Mysteries of Maisie Hitchins Series. Review: Do you like mysteries and short chapter books? Well The Case of the Stolen Sixpence by Holly Webb, is the perfect book for you. In this book, 12-year-old Maisie Hitchins wants to become a famous detective like her idol, but she can't because she has to stay home to help her grandma out. Then all of a sudden two strange mysteries come to her. Will Maisie be able to solve these mysteries by herself? Maisie Hitchins loves to hear about mysteries and likes to look for mysteries herself, but she doesn't have free time to do that. Instead she has to help her grandmother with chores. But then all of a sudden while buying food she finds a puppy almost half drowned. After that she is determined to find whoever tried to hurt the little creature. But a couple of days later another mystery comes in. Her friend George is fired from his job because he is accused of stealing money (sixpence) but he really didn't. So now Maisie has to do chores, help her grandmother, and find a way to escape from her house to solve two mysteries. Will Maisie be able to do all these things without getting caught and getting forbidden to solve the mysteries? The Case of the Stolen Sixpence is intended to be for readers of age 7-10. The book is very easy to read and has easy vocabulary, so a reader 7-10 years of age can understand what is happening in the story. The way the mystery is solved step by step is very clever because the readers can understand how Maisie Hitchins solves it. Both of the mysteries are a little hard to solve but if you really like mystery books and finding out mysteries then try to solve both cases before Maisie does. 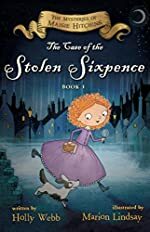 We would like to thank Houghton Mifflin Harcourt for providing a copy of The Case of the Stolen Sixpence for this review. Have you read The Case of the Stolen Sixpence? How would you rate it?